BEST-U project promotes the innovative technologies in order to improve the protection of the environment and the efficient use of water resources and soil protection. 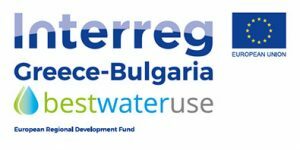 It is co-financed by the Interreg V-A Cooperation Programme Greece – Bulgaria 2014-2020, which is a cross-border cooperation Programme co-funded by the European Union under the European Regional Development Fund. BEST-U project will promote the cross border cooperation by bringing together different actors from the cross border area, in order to strengthen the development of the region and its transformation into a centre for sustainable development. The Specific Objective of the project is to enhance water management by promoting “green behavior” campaigns in the areas of water management, the implementation of pilot activities mainstreaming existing innovative methods/technologies and the formation of an overall educational policy of the local government. The networking platform aims to establish a network bringing together educational organizations, local authorities and the general public on water management issues. Through this network, experiences in policy and communication management of urban water will be exchanged and the available technology and know-how will be transferred among its members (Institutional strengthening).